In a prior life, I worked in advocacy and research at an international legal non-profit. There, I used service design to Iead the pilot LGBTI Refugee U.S. Resettlement Program in San Francisco, establishing a national model. LGBTI people around the world face persecution and violence. It's criminalized in 80+ countries, and punishable by death in more than 10. Rejected by their communities, queer refugees are especially vulnerable. Accessible video chat, online information and an international network of allies can provide immense support to refugees along their journey to resettlement. "What role can technology play in helping gay and lesbian refugees find safety?" As a Program Manager, I worked closely with LGBTI refugees currently living in countries of persecution or flight and facilitated their resettlement into countries of safety. With a team of researchers, lawyers and advocates, we formed insights into their needs and challenges. We often forget that programs and systems are designed by people. Yet they're designed according to budget and policy, and rarely with human experiences at the center. 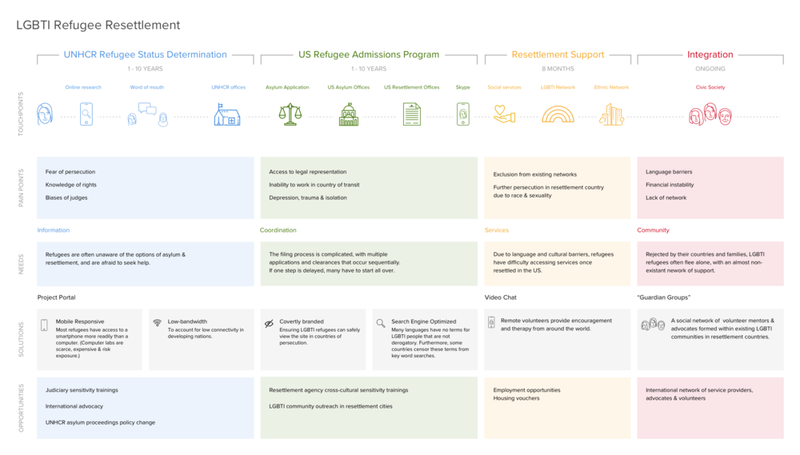 A journey map illustrates that if we reframe the resettlement process from a refugee's point of view, we can dynamically change service delivery models. As accessing resources was a key pain point in our clients' journey, we launched a website to provide information to refugees and those seeking to aid them. Understanding the compounded difficulties of being queer, foreign and a refugee, we piloted the first program for assisted resettlement of LGBTI refugees in the United States. To help refugees integrate, we formed “Guardian Groups” within existing LGBTI and allied community groups. Guardians supported LGBTI refugees remotely through video chat and email, and upon resettlement provided them with resources and housing. We advocated that LGBTI refugees be resettled in major metropolitan areas. To account for the intersecting experiences of LGBTI refugees, cities provide the best socio-geographical opportunities for integration and creating a new life. This service design model guided Refugee Resettlement Agencies' future work with this especially vulnerable population. Our report informed the Heartland Alliance International's Rainbow Welcome Initiative, backed by the United State's Health and Human Services’ Office of Refugee Resettlement and the Obama administration.